Waiting for a red light to change. 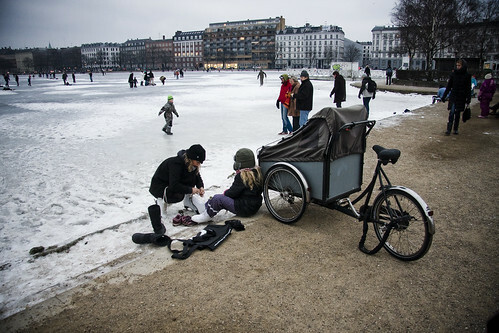 Mother and daugher rolled down to The Lakes on their cargo bike to go for a skate. 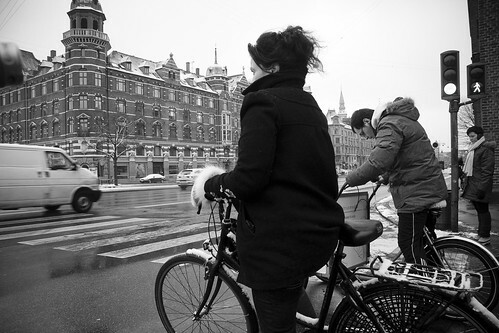 These make me want to go to Copenhagen, just to see the people. Nice job! I've never thought of biking as a winter activity. Your posts have sure changed that! I am coming back daily to see what you've captured next! What is striking for me is the sheer size of the streets where you are. They look so wide, like they would take for ever to cross. And lining your streets are those magnificently large buildings. I could imagine feeling really small in those streets. Wew.. bicycle can't be use to that thick snow. That's true, of course if so thick, it won't use skate to have fun riding. FOTOS MAGNÍFICAS, PARABÉNS PELO TRABALHO, EXCELENTE MESMO!!!!!!!!! !